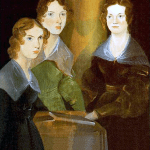 She’s a rare and writerly name that might have botanical ties, too. 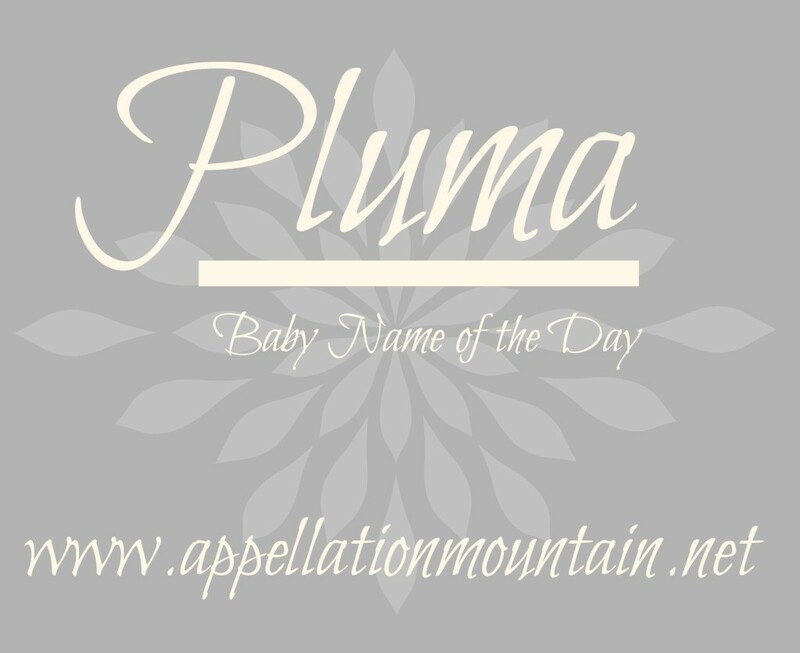 Thanks to Alexandra for suggesting Pluma as our Baby Name of the Day. First: a thought. Names like Pluma may be disappearing. Think about it. If a name has been coined since the 1960s or 70s, it is traceable. Yes, it might take some digging to find the perfume or the minor sitcom character. But it is findable. Message boards and forum posts, blogs chronicling this trend or that have the last decade or two covered. There’s no mystery to Miley. We might have the occasional curiosity, but they grow more and more rare. Pluma is a mystery, a name in use in the late nineteenth and early twentieth centuries. Back in 1884, ten baby Plumas arrived. There were 18 in 1904, and 22 in 1917. In a few of those years, it was enough to put Pluma in the US Top 1000. 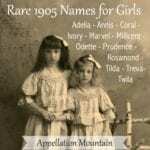 But then the numbers drop, and 1951 is the last year that five girls received the name. Since then, there have been fewer than five Plumas born in the US each year – maybe even zero. Hannah found her on a gravestone in Connecticut. My best guess is that she comes from the Latin word for feather. Think of plume and plumage. It’s also used in Spanish. Plumas County, California, gets its name from the Feather River – Rio de las Plumas. Plumes were, of course, once more common objects. Quills were still in use as writing implements into the nineteenth century, and plume remains the French word for pen. (Think of nom de plume.) This puts Pluma in the company of literary names like Novella and Fable. But is that the source of the name? Two other names pop in the late nineteenth and early twentieth century records: Plumie and Bluma. Plumie makes me think that the feather association is the right one. After all, names rise in clusters, and we’d expect to find Pluma and Plumie both inspired by the word, just like we have Madeline and Madison and Madalyn all ranking in the US Top 1000 today. I found a few girls named Plumma, too. Bluma is a Yiddish name. It means flower – think bloom. It’s not much of a stretch from Bluma to Pluma. But Pluma wasn’t a typo – I’ve found plenty of Plumas mentioned multiple times, including a Pluma Fidelia – a combination I just had to share. Then there’s the Irish word pluma, which means plum. Plum has surfaced as a girls’ given name in recent years, most often as a daring middle. While Pluma has slipped out of use in recent years, eleven girls were named Feather in 2012. Chances are that Pluma was a fanciful borrowing from feather, a name that had the briefest moment in vogue. It does still feel like something is missing – a song or a poem, something to inspire parents to borrow Pluma for their daughter’s names. Today she’d be even rarer, an antique with an elusive history. My name is Pluma and I was born in 2002, I thought I was the only one! My parents most likely named me after the Irish meaning of plum. This name was recently mentioned by Chef Vivian Howard on A Chef’s Life. She mentioned that she had an Aunt Pluma who grew blueberries. It was the first time I had ever heard the name. How exciting, Sarahbelle – thanks for sharing that tidbit! Interesting site I came across while researching the origin of my name. My great grandmother suggested the name for her granddaughter who died when only a few days old – so my mom decided to keep the name in the family by giving it to me. I have never met another person with my name. Kinda nice to know there are some out there. How very interesting! This is a name I never heard of, but even before reading the article, it made sense in my head, because the connection between “plume” and “feather” is still very clear. It’s terrible when you realise how much name history and knowledge dies out all the time – surely there was a reason Pluma got increased use in the early 20th century? For me Pluma brings to mind the flower plumeria aka frangipani. The feather connection makes a lot of sense… but since frangipani a really common perfume scent, I wonder if Pluma could have a brand of perfume? (Google is failing me and all I can find are perfume atomizers hidden in fountain pens.) Anyways, it’s a very pretty name. While plume is pen in France, pluma is pen in Spanish. I think it would be hard for me to use Pluma because of that. This is a very lovely name that, like jazzy, I have never seen until today. I love the nature and literary connection. I think this could also work as a contracted form of Paloma. What do you think? No ‘u’ in there, but I think it could work. Oh, and I went to high school with a male Feather, and it was surprisingly wearable. There’s a lot of names I’ve heard and know about it, but this is the first time I’ve heard of Pluma! I thought of Plume when I first saw it as well and figured it was an elaborate version of the name. I like the idea of it being a form of plum; I do love plums 🙂 But I pronounce it ploo-ma. The more I say the name out loud, the more it’s beginning to grow on me, especially with the nickname Plu.